Police are hunting for a Thai motorist who broke an Italian motorcyclist's arm with a hammer in Chon Buri's Muang district on Wednesday night. 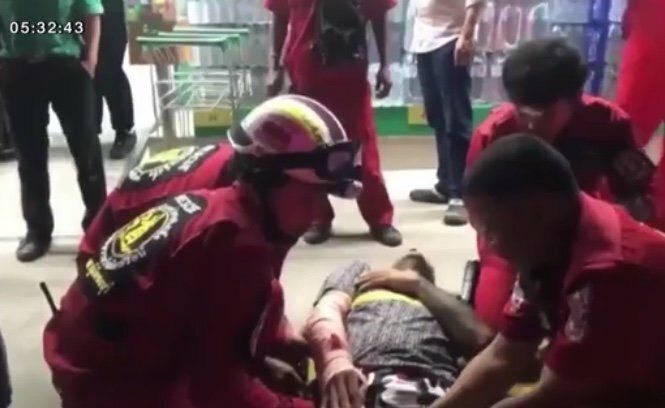 The victim, Denti Samuele, 40, was taken to the Chon Buri Hospital after the assault in front of the Lotus shopping mall in Tambon Samed at 10pm. Samuele's Thai girlfriend, Paritra Klaewklangsuek, 25, who was a pillion passenger, told police that Samuele had suffered from a broken leg earlier and could not ride fast. She said they noticed that a Honda car was trailing behind their motorcycle so they tried to avoid it, but the car stopped in front of them. She said an angry Thai man, who appeared intoxicated, got out of his car carrying a hammer. He accused her boyfriend of driving drunk and hit his right arm with the hammer. 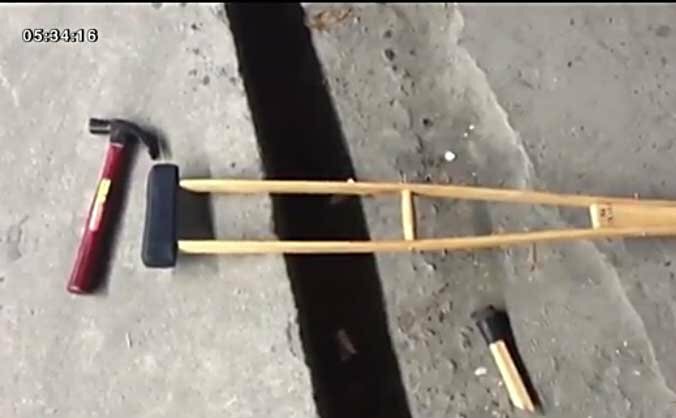 She said she fought back with her boyfriend's leg crutch and the Thai man fled back to his car and left the scene. Police plan to check footage of security cameras in the area. had suffered from a broken leg earlier and could not ride fast. Probably shouldn't have been riding at all ! What the hell was the clown doing riding an mc with a broken leg. there are soo many very slow drivers on the Thai roads. About 11 years ago, I took a tumble on Pattaya Tai during the water pipe fiasco and broke my ankle. 105k baht worth of surgery later, I was out and about with no weight-bearing for 4 months while the ankle healed. As most can imagine, the Thai's are like vultures when they see an injured foreigner ripe for the pickings. Baht buses wanted demanded 300 baht from Walking Street to just behind the Carrefour. More when it was raining. Tried motorbike taxi's a couple of times. In total fear for my life. If you are already injured from a motorbike accident, you will NOT get on the back of one of those guys more than once or twice. In the end, I rented a Honda Click so that I could stand the crutches up in front of the seat and drove myself. Much safer, and significantly less expensive, than the alternatives. he is not in a clown suit in the photo. As we all know is does not take much to set a Thai man off, when driving, road rage here is a very serious problem. Driving slowly is not a crime as far as i know, while we can regard driving too fast as a danger for everyone. Probably glad he's not old white and crass.. The allegedly intoxicated Thai driver decided to "pound" some sense into the Italian. All too common these days, xenophobic attacks on Foreigners. Embassies and travel agents really need to start warning people of the perils of Thailand, it aint what it was....although saying that, it use to happen but is only with the advent of social media it is now coming to the publics attention.